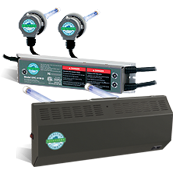 The UV Light System is installed in your air handling system by licensed professionals. The germicidal ultraviolet light rays produced by the UV Light system destroy micro-organisms that collect inside to help maintain a germ-free environment. Improve your air handling systems efficiency and performance, which can help reducing your operating costs and extending the life of your system.